Hari Batti's Green Light Dhaba: "Emission Intensity" Explained: small steps are good, but don't count on life being fair! "Emission Intensity" Explained: small steps are good, but don't count on life being fair! All over the world, eyes are glazing over at the sound of words like "voluntary reductions in emission intensity." But as silly as they sound, words like this matter. So today we are going to explain why cuts in "emission intensity" or "carbon intensity" are nothing to be afraid of--though they won't likely be enough to solve our problems. Along the way we are actually going to defend our Minister of Environment and Forests, Mr. Jairam Ramesh--something we never thought we'd have occasion to do, given all the foolish things he's been saying and doing lately. On Monday, opposition parties walked out of Parlaiment to protest remarks made by Mr. Ramesh regarding India's position at the Copenhagen climate negotiations. Mr. Ramesh has deserved such treatment in the past, but he didn't deserve it this time. The protesting parties said they were against India's proposed unilateral and voluntary 25-per cent reductions in emission intensity by the year 2020. All tamasha aside, the opposition was basically putting a populist face on business-as-usual policies. I'm all for sincere populism, but the continuation of business-as-usual policies would be a disaster for the whole country, and for poor people most of all. The cuts in "carbon intensity" or "emission intensity" that Mr. Ramesh is talking about are a good thing; if anything we should be protesting that they don't go deep enough. Since climate change is already affecting our GDP through extreme weather events and failing monsoons, I'm not sure why anyone is even thinking twice about this one! Where do you think most of the inflation we are seeing is coming from this year? (Hint: the answer starts with "drought" and ends with a "flood".) More efficient production, consumption and pollution will probably not solve our problems, but it is the least we can do. Being more efficient is not as hard as it looks. Much of this will happen automatically. 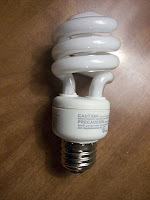 Think of all the shop keepers who have replaced their old-style light bulbs with CFL bulbs in recent years. I hate to break this to you, but that action was not a result of a growing sense of civic duty on the part of small business owners; they've been saving money by lowering their carbon intensity! I'm not going to sugar coat this for you. Cuts like this will not work unless we make a real commitment to limit needless over-consumption. In fact they are not likely to work even then; I'm guessing more radical actions will be required world wide. And there will be a price tag, even for the relatively modest cuts currently on the bargaining table. Big Oil and Big Business everywhere in the world will make much of this. But past experience and credible current research suggests that we can make a "significant impact" without affecting future growth much at all. The Chinese are proposing 40-45% cuts in their emissions intensity, and many analysts say they are actually already planning to do better than that. The Chinese cuts do not come without a cost. But the Chinese government clearly think it will be worth it in the long run. If we can't do 20-25%, we aren't being smart about how we are investing. Unfortunately, there is a pretty good chance this approach will simply not be enough to avoid major environmental-agricultural-economic-climate-related problems down the road. For one thing, it is unlikely that the rich countries are ready to commit to anything like what is required, regardless of what we do. Of course this is not fair, and the developing world needs to be ready for a long term struggle for climate justice. We'll be looking at issues related to this inequality next week. But we sometimes forget that there are, in fact, processes in the world that do not respond to what is "politically acceptable" or even "fair". Thanks to Space Bar for sending over this piece which reminds us that the "significant impacts" that optimistic economists talk about may fall short of what nature will require us to do if we are to avoid widespread social collapse and famine. So let's agree to cuts in emission intensity, but let's not kid ourselves into thinking those cuts will be enough. If we want to leave a world fit for our children and their children, we need to prepare ourselves for the possibility that we will be required to make changes of a different order entirely. It's not fair, is it? But that's the way life is. Any kid will tell you. Elsewhere on the web, Annie Zaidi's beautiful "Song, 2" in remembrance of Bhopal. Want to do and learn more about Climate Change? Ms. Supriya Singh, Environment Defence Fund. For more information, go here. Or see the FB event page here. I'm really glad I don't have children. Based on what I've repeatedly heard and researched, we're more or less screwed. If most reports have even a grain of truth, we're already past the time of action. Suppose for arguments sake, we find out for sure that unless we completely stop emitting carbon from tomorrow, humanity will be wiped out in ten years. I don't think even that will cause countries to stop. Many would prefer the world to end than give up their lifestyles as they stand right now. For many, it won't be a choice, since they have to use cars to survive. Even the government won't impose it since there will be elections within 10 years and any government that imposes this will get wiped out. My gut feel is that like many other specialized species that were wiped out, who were so good at one thing, that they weren't able to change when necessary, humanity will will also be consigned to the bin of history. And if intelligent life ever starts again on earth, there won't be anyone to let them know who we were. No wonder we can't find intelligent life anywhere in the universe. They've all self destructed! At some point we will all realize this: the earth does not have to be a reasonable negotiation partner; in fact in most cases, the laws of nature are not subject to amendment no matter how many people or nations sign treaties and petitions to the contrary.